The Register's Tony Smith has posted an interesting piece, here, regarding the causes of Vista crashes in 2007. 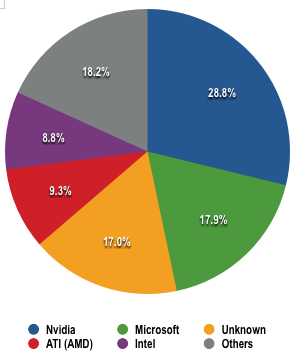 According to Microsoft internal mail Nvidia drivers were to blame for 28.8% of the reported Vista crashes in 2007 with Microsoft's own software accounting for 17.9% of the crashes. This is actually quite interesting to me because since I started using Vista over a year ago I've had two crashes. Both of these, one only a few days ago, were down to Nvidia drivers. It's nice to see I'm not exactly alone in this one.